Ritemaster Iachesis of the Psijic Order hopes to learn more from the abyssal pearl. Specifically, he wants to determine where K'Tora and the Sea Sload cabal are hiding. I agreed to help in any way I can. "Thanks to the orbs of B'Raken Drel, your deepest memories will be mine!" 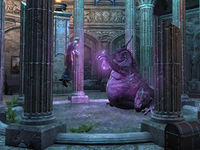 Follow Iachesis and help him defend Artaeum from the attacking yaghra. 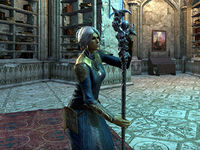 Check on the ancient relics in the Psijic Relic Vaults. Wait until Iachesis confronts the Sea Sload sorcerer. Speak to Valsirenn about what to do next. Retrieve Ul'vor Staff for Valsirenn and let her open a portal. Enter the mindscape and defeat K'Tora. Exit the mindscape and talk to Sotha Sil. Return to Ceporah Tower to discuss the occurred events with Iachesis. I need to meet the Ritemaster in Ceporah Tower's main gallery and talk to him there. The Ritemaster headed for the southeast beach to deal with the yaghra incursion. I should meet him in that location. I followed the Ritemaster through the ruins of the College of Psijics and onto the southeastern shore of the island. I should talk to the Ritemaster before we proceed. I need to destroy the abyssal pearl to close the portal that gives the yaghra access to Artaeum. 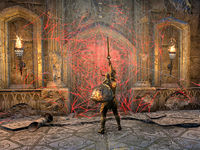 Now that the yaghra portal has been destroyed, I should accompany the Ritemaster to the old vaults to make sure the Psijic relics are secure. I entered the Psijic relic vaults. I should talk to the Ritemaster and determine what he thinks we need to do in here. The Ritemaster suggested that we start our search of the vaults in the central rotunda at the top of the stairs. I should follow him. The Ritemaster suggested I try to burn the barrier of webbing so we can enter the central rotunda. The barrier of webbing wouldn't burn, but the Golden Knight appeared again and opened the way with his glowing sword before vanishing. I should enter the central rotunda now. The Ritemaster moved to confront the Sea Sload, K'Tora. I should wait and see what happens. Valsirenn has called to me from outside the central rotunda. I should go and talk to her so we can figure out how to help the Ritemaster. Valsirenn sent me in search of one of the relics in the vault, the Ul'vor Staff. She said she can use it to free the Ritemaster from K'Tora's mind magic. I can use the wardkey she provided to open the various repositories as I search. I found the Ul'vor Staff. Now to take it to Valsirenn and see if it can help us free the Ritemaster. Valsirenn has opened a path to the mindscape with the Ul'vor Staff. I need to touch it so I can enter the mindscape and save the Ritemaster. Valsirenn says I need to defeat K'Tora's guardian to reveal the memory it's defending. Only then can I continue to search for the Ritemaster in this alien mindscape. Another guardian and another memory to uncover. I need to defeat the guardian before I can find the Ritemaster. One last memory guardian to vanquish and then I should be able to reach the Ritemaster and K'Tora. I revealed K'Tora's memories and saw how the cabal made a deal with the Daedric Princes, defeated the Ritemaster, altered his memories, and forced him to take the Heart of Transparent Law and hide it. Now I need defeat K'Tora and free the Ritemaster. I freed the Ritemaster and defeated K'Tora. I need to use the Ul'vor Staff to exit this mindscape before it completely fades away and I'm trapped inside forever. I emerged from the mindscape to find Sotha Sil standing before me. I should speak to him. I need to leave these vaults and return to Ceporah Tower so I can see how the Ritemaster is faring after his ordeal in the mindscape. I need to return to Ceporah Tower and see how the Ritemaster is faring after his ordeal in the mindscape. Finishes quest K'Tora forced the Ritemaster to steal the Heart of Transparent Law from the Crystal Tower, but he doesn't remember where he hid it. I should talk to him and see what I can do to help restore his memory. This page was last modified on 17 September 2018, at 09:35.